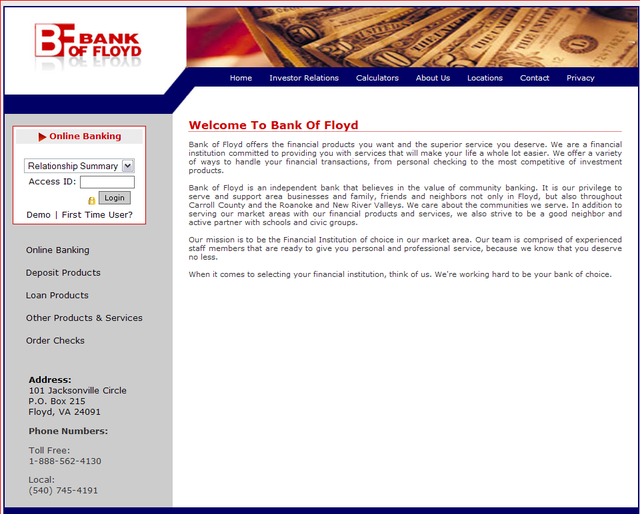 Bank of Floyd Online Customers are being sent phishing emails by someone calling himself Ted Kaczynski. I fell for it this morning and now have had to close my account and debit card and reopen new ones. Ouch! This is not how I planned to spend Monday morning! This is your official notification from Bank of Floyd, your online account has expired. continue using our service you have to renew your online account. If not, your online account will be deactivated and deleted. 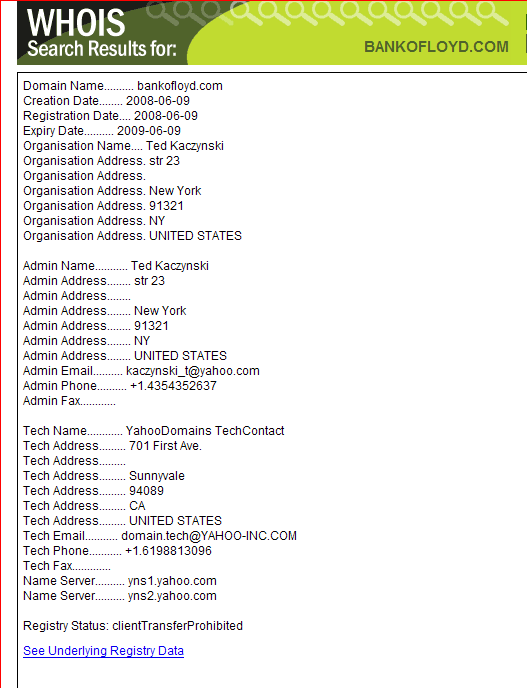 Note that the fake site URL is bankofloyd.com. 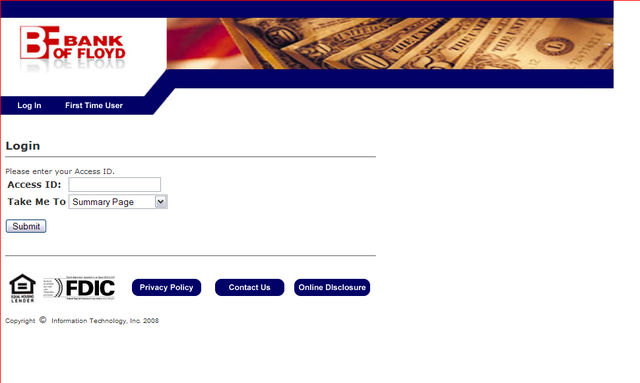 Here is the information on the registration of bankofloyd.com. It was created this very morning. I called the Bank of Floyd Online Accounts department and they told me that the emails were fake and to just delete the email. When I explained that there was a fake site that was collecting customer data, she went online and verified for herself that there was, indeed, a site using BANKOFLOYD.COM as its URL. She agreed to lock my account until I could get down there and reopen it with new passwords and security data. This is a really clever scam that took advantage of the fact that the real BOF did not register many different variations of bankoffloyd.com. Usually companies will register hyphenated versons and commonly misspelled versions of their domain name to prevent others from stealing traffic or phishing for customer information. 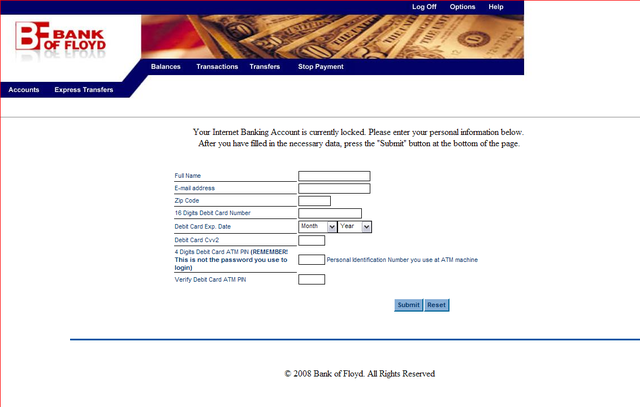 If you have a Bank of Floyd online account, you should not fall for this phishing email. Call the Bank of Floyd and ask before submitting any data. If you fell for it as I did, your debit card information is probably on its way to several different continents and you will need to close out that debit card and start over. What a way to begin a week! Gretchen and I went into the bank and were given great service by Carolyn Reed, Assistant Vice President Customer Service. We were issued new debit cards and new passwords for the account. The bank had received the first calls from customers early in the morning and held a management meeting to deal with the problem. According to Leon Moore, President of the Bank of Floyd, the FBI has been notified and the bank will be sending an email notice to all bank customers to ignore the earlier fake email. Leon also said that he had received calls from people who received the emails and were not BOF customers. Leon made the point that the Bank of Floyd does not inform customers of changes by email. They send notices by regular mail. This entry was posted in News blogging and tagged Bank of Floyd Online Accounts, Floyd Virginia, Phishing email, Ted Kaczynski. Bookmark the permalink. If your debit card arrives in France I will do my best to grab it!